A good choice for users with speedy faxing requirements, the Ricoh Fax 3320L printer boasts impressive 3-second transmission speeds plus secure features that prevent unauthorised users from accessing sensitive data being processed by this machine. While it can be a great solution for a small office or a growing business, the Fax 3320L from Ricoh may not be the best choice for those who need print and scan functions. This desktop fax machine looks boxy with its 17.6-inch wide, 5.5-inch tall, and 16.1-inch deep frame that weighs approximately18.5Kg. The Ricoh 3320L fax machine includes a 33.6Kbps fax modem with auto fall-back technology. The topmost part is dominated by the plastic document feeder, while directly beneath that feature is the small but organised control panel with a small display screen. The paper cassettes are loaded in front of the Ricoh Fax 3320L laser fax. The Fax 3320L printer takes a single black Ricoh Type 1260 fax toner which lasts for up to 5,000 pages. The standard memory can store up to 640 pages, and when users upgrade the memory of the Ricoh Fax 3320L mono laser printer to 40MB, it can already store up to 1,500 pages. The device includes an auto dialler for 5 groups, 100 speed dials, and 30 quick dials, while 5 dedicated keys offer one-touch operational convenience. Users can save time with the 50-sheet automatic document feeder. The Ricoh 3320L fax printer is notably fast, printing at up to 15ppm, and the overall paper capacity can be increased to 500 pages. 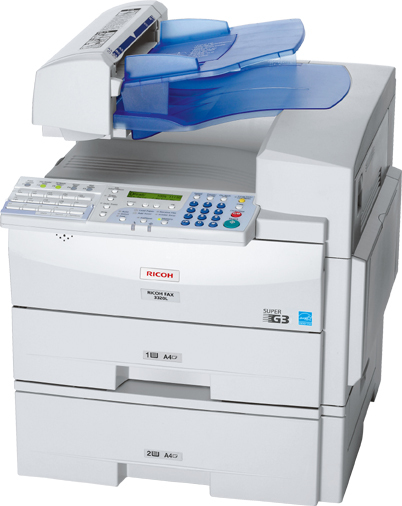 The Ricoh 3320L Fax lacks scan and print options and it is quite oversized and overweight for a fax machine. The scan resolution for the fax feature is only up to 200x400dpi, so very detailed graphics and pictures may lose their detail. Another drawback on the Ricoh 3320L laser fax machine is the absence of colour printing.